Ayyankere showing northern islands with feeding streams. bl.uk > Online Gallery Home	> Online exhibitions	> Asia, Pacific and Africa Collections	> Ayyankere showing northern islands with feeding streams. 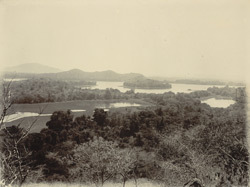 Photograph of a view of Ayyankere taken in the 1890s by an unknown photographer is from the Curzon Collection's 'Souvenir of Mysore Album'. It shows a general view across the artificial lake.